A boozed-up dangerous driver crashed after she was spotted speeding and weaving in the road during a high-speed police chase. 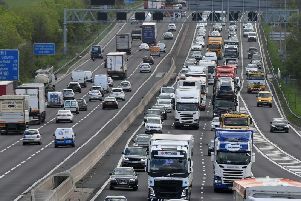 Chesterfield magistrates’ court heard on March 19 how Jodie Kelly, 25, of New Delves Court, Heanor, was followed from Junction 26, of the M1, near Awsworth to the A610, after she was spotted speeding and she refused to stop before hitting a corner and losing a wheel. She added that the vehicle was expected to slow down but it was doing 70mph in a 50mph zone and it was struggling to stay in a straight line and it was weaving and failed to reduce its speed in a 40mph zone. The police vehicle activated its blue lights and siren, according to Mrs Allsop, but Kelly sped up to 90mph in a 40mph restricted area. Mrs Allsop said the Astra went through green traffic lights before going through a second set of traffic lights which were on red. Kelly took a bend too fast and clipped a corner, according to Mrs Allsop, and the vehicle moved from side-to-side and bounced before one of the wheels came away from the vehicle. The court heard that there had been a passenger in the car and Kelly climbed into the back of the vehicle after the collision and claimed she had not been the driver. Kelly pleaded guilty to driving dangerously, exceeding the alcohol drink-drive limit, using a vehicle without insurance and without a licence. She also admitted failing to stop when required to do so by a police officer. Defence solicitor Charles Clarke said that due to the manner of the driving, the high speeds involved and the that there had been a police chase it was expected that the case should be sent to crown court. Magistrates committed the case for sentencing at Nottingham Crown Court on April 9. Kelly was also given an interim six-month driving disqualification and she was released on unconditional bail until her crown court hearing.